Obelisks were prominent in the architecture of the ancient Egyptians, who placed them in pairs at the entrance of temples. The word “obelisk” as used in English today is of Greek rather than Egyptian origin becauseHerodotus, the Greek traveller, was one of the first classical writers to describe the objects. A number of ancient Egyptian obelisks are known to have survived, plus the “Unfinished Obelisk” found partly hewn from its quarry at Aswan. These obelisks are now dispersed around the world, and fewer than half of them remain in Egypt. The earliest temple obelisk still in its original position is the 68-foot (20.7 m) 120-ton red granite Obelisk of Senusret I of the XIIth Dynasty at Al-Matariyyah part of Heliopolis. It is hypothesized by New York University Egyptologist Patricia Blackwell Gary and Astronomy senior editor Richard Talcott that the shapes of the ancient Egyptian pyramid and obelisk were derived from natural phenomena associated with the sun (the sun-god Ra being the Egyptians’ greatest deity). The pyramid and obelisk might have been inspired by previously overlooked astronomical phenomena connected with sunriseand sunset: the zodiacal light and sun pillars respectively. The Ancient Romans were strongly influenced by the obelisk form, to the extent that there are now more than twice as many obelisks standing in Rome as remain in Egypt. All fell after the Roman period except for the Vatican obelisk and were re-erected in different locations. The tallest Egyptian obelisk is in the square in front of the Lateran Basilica in Rome at 105.6 feet (32.2 m) tall and a weight of 455 tons. Not all the Egyptian obelisks in the Roman Empire were set up at Rome. Herod the Great imitated his Roman patrons and set up a red granite Egyptian obelisk in the hippodrome of his new city Caesarea in northern Judea. This one is about 40 feet (12 m) tall and weighs about 100 tons. It was discovered by archaeologists and has been re-erected at its former site. In Constantinople, the Eastern Emperor Theodosius shipped an obelisk in AD 390 and had it set up in his hippodrome, where it has weathered Crusaders and Seljuks and stands in the Hippodrome square in modernIstanbul. This one stood 95 feet (29 m) tall and weighing 380 tons. Its lower half reputedly also once stood in Istanbul but is now lost. The Istanbul obelisk is 65 feet (20 m) tall. Re-erecting the obelisk had daunted even Michelangelo, but Sixtus V was determined to erect it in front of St Peter’s, of which the nave was yet to be built. He had a full-sized wooden mock-up erected within months of his election. Domenico Fontana, the assistant of Giacomo Della Porta in the Basilica’s construction, presented the Pope with a little model crane of wood and a heavy little obelisk of lead, which Sixtus himself was able to raise by turning a little winch with his finger. Fontana was given the project. The obelisk, half-buried in the debris of the ages, was first excavated as it stood; then it took from April 30 to May 17, 1586 to move it on rollers to the Piazza: it required nearly 1000 men, 140 carthorses, and 47 cranes. The re-erection, scheduled for September 14, the Feast of the Exaltation of the Cross, was watched by a large crowd. It was a famous feat of engineering, which made the reputation of Fontana, who detailed it in a book illustrated with copperplate etchings, Della Trasportatione dell’Obelisco Vaticano et delle Fabriche di Nostro Signore Papa Sisto V (1590), which itself set a new standard in communicating technical information and influenced subsequent architectural publications by its meticulous precision. Before being re-erected the obelisk was exorcised. It is said that Fontana had teams of relay horses to make his getaway if the enterprise failed. When Carlo Maderno came to build the Basilica’s nave, he had to put the slightest kink in its axis, to line it precisely with the obelisk. An obelisk stands in front of the church of Trinità dei Monti, at the head of the Spanish Steps. Another obelisk in Rome is sculpted as carried on the back of an elephant. Rome lost one of its obelisks, which had decorated the temple of Isis, where it was uncovered in the 16th century. The Medici claimed it for the Villa Medici, but in 1790 they moved it to the Boboli Gardens attached to the Palazzo Pitti in Florence, and left a replica in its stead. Several more Egyptian obelisks have been re-erected elsewhere. The best-known examples outside Rome are the pair of 21-metre 187-ton Cleopatra’s Needles in London (69 ft) and New York City (70 ft) and the 75-foot (23 m) 227-tonobelisk at the Place de la Concorde in Paris. The White Obelisk (named due to its colour), was discovered by Hormuzd Rassam in 1853 at Nineveh. The obelisk was erected by either Ashurnasirpal I (1050-1031 BC) or Ashurnasirpal II (883-859 BC). The obelisk bears an inscription that refers to the king’s seizure of goods, people and herds, which he carried back to the city of Ashur. The reliefs of the Obelisk depict military campaigns, hunting, victory banquets and scenes of tribute bearing. The Black Obelisk was discovered by Sir Austen Henry Layard in 1846 on the citadel of Kalhu. The obelisk was erected by Shalmaneser III and the reliefs depict scenes of tribute bearing as well as the depiction of two subdued rulers, Jehu the Israelite and Sua the Gilzanean, giving gestures of submission to the king. The reliefs on the obelisk have accompanying epigraphs, but besides these the obelisk also possesses a longer inscription that records one of the latest versions of Shalmaneser III’s annals, covering the period from his accessional year to his 33rd regnal year. King Ezana’s Stele in Axum. A number of obelisks were carved in the ancient Axumite Kingdom of today northern Ethiopia. 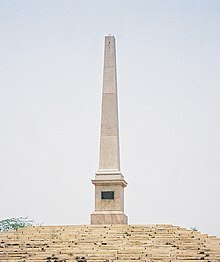 Together with (21 m high) King Ezana’s Stele, the last erected one and the only unbroken, the most famous example of axumite obelisk is the so-called (24 m high) Obelisk of Axum. It was carved around the 4th century AD and, in the course of time, it collapsed and broke into three parts. In these conditions it was found by Italian soldiers in 1935, after the Second Italo-Abyssinian War, looted and taken to Rome in 1937, where it stood in the Piazza di Porta Capena. Italy agreed in a 1947 UN agreement to return the obelisk but did not affirm its agreement until 1997, after years of pressure and various controversial settlements. In 2003 the Italian government made the first steps toward its return, and in 2008 it was finally re-erected. 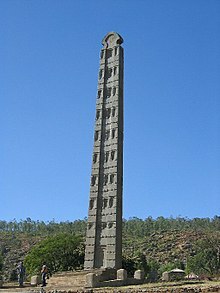 The largest known obelisk, the Great Stele at Axum, now fallen, at 33 m high and 3 by 2 metres at the base (520 tons) is one of the largest single pieces of stone ever worked in human history (the largest is either atBaalbek or the Ramesseum) and probably fell during erection or soon after, destroying a large part of the massive burial chamber underneath it. The obelisks, properly termed stelae or the native hawilt or hawilti as they do not end in a pyramid, were used to mark graves and underground burial chambers. The largest of the grave markers were for royal burial chambers and were decorated with multi-storey false windows and false doors, while nobility would have smaller less decorated ones. While there are only a few large ones standing, there are hundreds of smaller ones in “stelae fields”. The prehistoric Tello Obelisk, found in 1919 at Chavín de Huantar in Peru, is a monolith stele with obelisk-like proportions. It was carved in a design of low relief with Chavín symbols, such as bands of teeth and animal heads. Long housed in the Museo Nacional de Arqueología, Antropología e Historia del Perú in Lima, it was relocated to the Museo Nacional de Chavín, which opened in July 2008. The obelisk was named for the archeologist Julio C. Tello, who discovered it and was considered the “father of Peruvian archeology.” He was America’s first indigenous archeologist. In late summer 1999, Roger Hopkins and Mark Lehner teamed up with a NOVA (TV series) crew to erect a 25-ton obelisk. 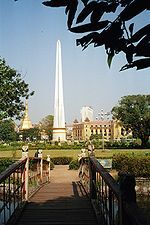 This was the third attempt to erect a 25-ton obelisk; the first two, in 1994 and 1999, ended in failure. There were also two successful attempts to raise a two-ton obelisk and a nine-ton obelisk. Finally in Aug–Sep of 1999, after learning from their experiences, they were able to erect one successfully. One experiment was to transport a small obelisk on a barge in the Nile River. The barge was built based on ancient Egyptian designs. It had to be very wide to handle the obelisk, with a 2 to 1 ratio length to width, and it was at least twice as long as the obelisk. The obelisk was about 10 feet long and no more than 5 tons. A barge big enough to transport the largest Egyptian obelisks with this ratio would have had to be close to 200 feet long and 100 feet wide. The workers used ropes that were wrapped around a guide that enabled them to pull away from the river while they were towing it onto the barge. The barge was successfully launched into the Nile. The final and successful erection event was organized by Rick Brown, Hopkins, Lehner and Gregg Mullen in a Massachusetts quarry. The preparation work was done with modern technology, but experiments have proven that with enough time and people, it could have been done with ancient technology. To begin, the obelisk was lying on a gravel and stone ramp. A pit in the middle was filled with dry sand. Previous experiments showed that wet sand would not flow as well. The ramp was secured by stone walls. Men raised the obelisk by slowly removing the sand while three crews of men pulled on ropes to control its descent into the pit. The back wall was designed to guide the obelisk into its proper place. The obelisk had to catch a turning groove which would prevent it from sliding. They used brake ropes to prevent it from going too far. Such turning grooves had been found on the ancient pedestals. Gravity did most of the work until the final 15° had to be completed by pulling the obelisk forward. They used brake ropes again to make sure it did not fall forward. On September 12 they completed the project. This experiment has been used to explain how the obelisks may have been erected in Luxor and other locations. It seems to have been supported by a 3,000-year-old papyrus scroll in which one scribe taunts another to erect a monument for “thy lord”. The scroll reads “Empty the space that has been filled with sand beneath the monument of thy Lord.”  To erect the obelisks at Luxor with this method would have involved using over a million cubic meters of stone, mud brick and sand for both the ramp and the platform used to lower the obelisk. The largest obelisk successfully erected in ancient times weighed 455 tons. A 520-ton stele was found in Axum, but researchers believe it was broken while attempting to erect it. Ripon Market Square obelisk (Nicholas Hawksmoor) 1702 – at 80 feet in height it was the first large scale obelisk to be erected in Britain. St Luke Old Street (church), London, spire by Nicholas Hawksmoor circa 1727-33. Mamhead obelisk, one hundred feet, built 1742-1745 as an aid to shipping. Montreal Park Obelisk, Riverhead, Sevenoaks, Kent – Lord Jeffery Amherst’s Obelisk, 1761. Villa Medici, Rome – a 19th-century copy of the Egyptian obelisk moved to the Boboli Gardens in Florence in 1790. Nelson memorial, Springfield Park, Liverpool, circa 1805. “Brightling Needle”, Brightling, East Sussex (65 ft), circa 1815. Patriots’ Grave, Old Burying Ground, Arlington, Massachusetts (1818). Captain Cook’s Monument, Easby Moor, Great Ayton, North Yorkshire, 1827 (15.5m, 51 ft). Bunker Hill Monument, Charlestown, Massachusetts – built between 1827 and 1843. Obelisk of Lions, in Iași, Romania, 1834. Villa Torlonia, Rome – two obelisks erected 1842. Reggio Emilia obelisk, commemorates marriage of Francis V, Duke of Modena to princess Adelgunde of Bavaria, built 1842. Rutherford’s Monument near Anwoth, Scotland erected in 1842 as a memorial to Samuel Rutherford. The Political Martyrs monument, Edinburgh, erected 1844 as a memorial to the “Scottish Martyrs to Liberty”. Lansdowne Monument, near the Cherhill White Horse, Wiltshire, 1845, 38 metres, erected by the 3rd Marquess of Lansdowne to commemorate Sir William Petty. Newcastle, New South Wales – “The Obelisk”, built 1850. Wellington Monument, Wellington, Somerset, completed 1854, (53.34m, 175 ft). Stoodley Pike, Todmorden, West Yorkshire, built 1856. 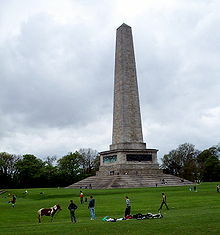 Wellington Monument, 1861, (62m, 205 ft), Phoenix Park, Dublin, Ireland, is the tallest in Europe. 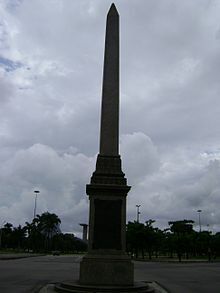 The Obelisk, (Prince of Wales’), Port Elizabeth, South Africa, intended for one George Kemp but erected to commemmorate the marriage of Albert Edward, Prince of Wales and Alexandra of Denmark in 1861. Originally on Market Square, now in front of the Bayworld Museum Complex. Lincoln’s Tomb in Springfield, Illinois, 1865, (35.66m, 117 ft). Nicholson’s obelisk, Margalla Hills, Pakistan 1868. Captain Cook Obelisk, Kurnell, New South Wales, 1870. The Dauphin County Veteran’s Memorial Obelisk in Harrisburg, Pennsylvania, completed 1876, (33.52m, 110 ft). 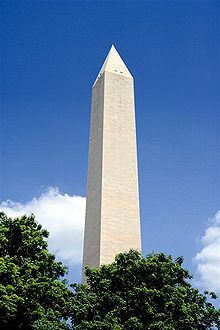 The Washington Monument in Washington DC, USA, measuring 555 feet 5.5 inches (169.29 m) in height, is the world’s tallest true obelisk; completed in 1884. The Oriskany Battlefield monument in Rome, New York, dedicated in 1884 as a memorial to the Revolutionary War battle in 1777. The Bennington Battle Monument in Bennington, Vermont, 1889. Dalhousie Obelisk, in Raffles Place, Singapore, 1891. Spencer Monument in Blata l-Bajda, Malta, 1893. The Obelisk, University Park campus of Penn State University, 1896. The William Dudley Chipley Memorial, in the Plaza Ferdinand VII, Pensacola, Florida, 1901. The Sergeant Floyd Monument, on US Highway 75, Sioux City, Iowa, 1901. Joseph Smith Birthplace Memorial, South Royalton, Vermont, 1905. McKinley Monument, Niagara Square, Buffalo, New York, 1907, (96 ft / 29 m). The Veterans’ Monument, Elizabethton, Tennessee, dedicated in 1904 to American Civil War veterans from Carter County, Tennessee. The Chalmette Monument, in Chalmette, Louisiana, commemorating the Battle of New Orleans, 1908. The Victory Memorial, Fort Recovery, Ohio, completed in 1913. The National Women’s Monument in Bloemfontein, South Africa, It was erected in 1913. The PAX Obelisk, Walmer, Port Elizabeth, as a World War I memorial to local fallen soldiers, 1919. The Henry M. Flagler obelisk located on Flagler Monument Island in Miami Beach, Florida was built in 1920. The War Memorial in London Square, Southport, Lancashire, England, designed by Grayson and Barnish, 1923. It is flanked by two colonnades each supported by Doric columns, all constructed of Portland stone. Veterans Memorial Plaza at Indiana World War Memorial Plaza in Indianapolis, Indiana was built in 1923. Jefferson Davis Monument at Jefferson Davis State Historic Site in Fairview, Kentucky, (351 ft / 107 m) tall, mostly concrete, 1924. 1925 Hobart Cenotaph, a World War I memorial. A large obelisk with the world’s largest apple on top stands at Cornelia, Georgia. It was erected in 1925. The Foshay Tower, in Minneapolis, Minnesota, modeled after the Washington Monument, 1929. Obelisk of Montevideo, Uruguay, 1930. High Point Monument, Montague, New Jersey. A (220 ft /67 m) obelisk on top of New Jersey’s highest point, 1,803 ft (550 m) above sea level, 1930. Foro Italico, Rome (on Lungotevere Maresciallo Diaz), erected to honour Benito Mussolini, 1932. 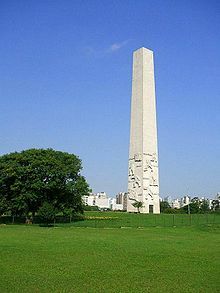 Obelisk of Buenos Aires, Argentina, 1936. The War Memorial in Floriana, Malta, 1938. San Jacinto Monument in La Porte, Texas commemorating the Texan army’s victory at the Battle of San Jacinto and thus gained independence over Mexico, 1939. Trylon and Perisphere, 1939 New York World’s Fair, Flushing, New York; not a true obelisk, but an art deco variant, (700 ft / 213 m), 1939. The Obelisk on One Tree Hill in Auckland, New Zealand, 1940. Manzanar Obelisk, Independence, California Monument to honor Japanese interned during WWII, 1943. 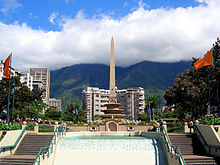 Plaza Francia obelisk in Caracas, Venezuela, 1944. Memorial in Safed, Israel to soldiers who died in the Israel War of Independence. Obelisk of São Paulo, Brazil, 1954. Abolition Park in Ponce, Puerto Rico, 1956. Trujillo Obelisk, Santo Domingo, Dominican Republic, 1960, (137 ft / 42 m). Demidov Column in Barnaul, Siberia, Russia. A small obelisk stands at Trinity site, the location of the first atomic bomb explosion. Rugby, North Dakota, the geographical center of North America (Mexico, USA and Canada). Pirulito da Praça Sete in Belo Horizonte, Brazil. 21 obelisks mark Boise, Idaho‘s portion of the Oregon Trail. In Las Vegas, Nevada, U.S., an obelisk stands in front of the Luxor Hotel, a pyramid-shaped hotel along The Strip. An obelisk stands in front of radio talk show host Clint Ferro’s boyhood home, Endicott, New York, 1975. 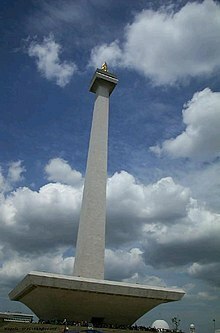 Monumen Nasional, symbolizing the fight for the independence of Indonesia, at Merdeka Square, Jakarta, 1975. A large obelisk stands in North Korea called the Juche Tower, 1982. Memorial to Egypt’s fallen soldiers in the 1948 Arab-Israeli War, at Ad Halom, Israel. Capas National Shrine in Tarlac province, Philippines, a 70-meter obelisk erected in 2003. Pond and white obelisk monument in the main square of Vigan City in the Philippines. Obelisco Novecento, Rome, 2004. Sculpture by Arnaldo Pomodoro. Cyclisk is a 65-foot-high obelisk made of 350 bicycles erected in Santa Rosa, California. ^ “NOVA Online | Mysteries of the Nile | A World of Obelisks: Cairo”. 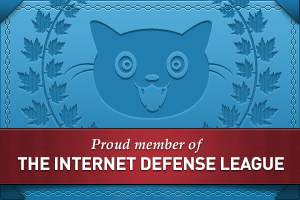 Pbs.org. Retrieved 2013-06-14. ^ Patricia Blackwell Gary and Richard Talcott, “Stargazing in Ancient Egypt”, Astronomy, June 2006, pp. 62-67. ^ a b “NOVA Online | Mysteries of the Nile | A World of Obelisks: Rome”. Pbs.org. Retrieved 2013-06-14. ^ “Caesarea Obelisk”. Highskyblue.web.fc2.com. 2001-06-18. Retrieved 2013-06-14. ^ “NOVA Online | Mysteries of the Nile | A World of Obelisks: Istanbul”. Pbs.org. Retrieved 2013-06-14. ^ James Lees-Milne, Saint Peter’s (1967). ^ “NOVA Online | Mysteries of the Nile | A World of Obelisks”. Pbs.org. Retrieved 2013-06-14. ^ “NOVA Online | Mysteries of the Nile | August 27, 1999: The Third Attempt”. Pbs.org. 1999-08-27. Retrieved 2013-06-14. ^ Barnes 2004, p. 18. ^ “English Heritage | English Heritage”. Risk.english-heritage.org.uk. Retrieved 2013-06-14. ^ The Obelisk ( Brightling Needle):: OS grid TQ6721 :: Geograph British Isles – photograph every grid square! ^ “Spencer Monument – Blata l-Bajda, Malta”. Waymarking.com. Retrieved 2013-07-07. ^ “The War Memorial”. Times of Malta. 2012-06-23. Retrieved 2013-07-07. ^ “Oregon Trail Monuments – Boise Arts & History”. Boiseartsandhistory.org. Retrieved 2013-06-14. Chaney, Edward, “Roma Britannica and the Cultural Memory of Egypt: Lord Arundel and the Obelisk of Domitian”, in Roma Britannica: Art Patronage and Cultural Exchange in Eighteenth-Century Rome, eds. D. Marshall, K. Wolfe and S. Russell, British School at Rome, 2011, pp. 147-70. Octavo Edition of Domenico Fontana’s book depicting how he erected the Vatican obelisk in 1586.